What do bad backlinks do to my site? Having low-quality, spam backlinks pointing to your website is not only bad from a ranking point of view but it can also be extremely detrimental to the credibility of your brand. No business should want to have external references from untrustworthy, deceitful sources and this same mentality should transpire into your online marketing efforts. Before the introduction of Panda and more importantly Penguin, many so called “SEO Experts” were able to easily manipulate and trick Google’s algorithms by rolling out automated link building tactics where links to client websites were placed on 1000’s of directories, article websites and social bookmarking networks at the click of a button. This quantity over quality approach on some occasions achieved some form of ranking success and unfortunately deceived the client into thinking an ethical job had been done. However, the longevity of this strategy soon caught up with most and on 25th May 2012 Google began to heavily penalise websites that had participated in these underhand strategies with the roll out of their Penguin update. This update was specifically aimed at decreasing search engine visibility of websites that had participated in what Google deemed to be ‘black hat’ techniques including; cloaking, keyword stuffing and link networks to name but a few. Back in October 2012, Google introduced it’s widely anticipated Disavow tool allowing webmasters and site owners to inform Google of the low quality links in their backlink profiles and request that these be ignored when determining the position of their website in the search index. However, Google were very quick to stress that all efforts must be carried out to first attempt to remove low quality links before using the Disavow tool. There are a number of tools out there to help you automate the rather mundane process of identifying bad backlinks, however, I prefer to adopt a much more granular approach when evaluating a website’s backlink profile as automated tools can adopt false negative and false positive results. This guide illustrates the steps needed to fully identify the harmful links in your backlink profile. Before diving straight in and identifying the low quality backlinks it’s first good to establish whether or not your website may have been hit with a Google penalty. There are two types of Google link penalties, the first being a manual penalty and the second being an algorithmic (Penguin) penalty. If your website has been hit with a manual penalty you will be notified in Google Webmaster Tools with a detection of unnatural links message. It is unknown as to what causes Google to begin reviewing your website on a manual basis however there is speculation that someone submitting a spam report against your website or targeting overly competitive niches such as loans or insurance will trigger Google to monitor your website more closely. Google won’t notify you if you have been hit with an algorithmic penalty, however you may begin to see a decrease in organic search traffic around the time of algorithm refreshes. The best way to determine loss of traffic around algorithm changes is through syncing up your website analytics with the Panguin tool. 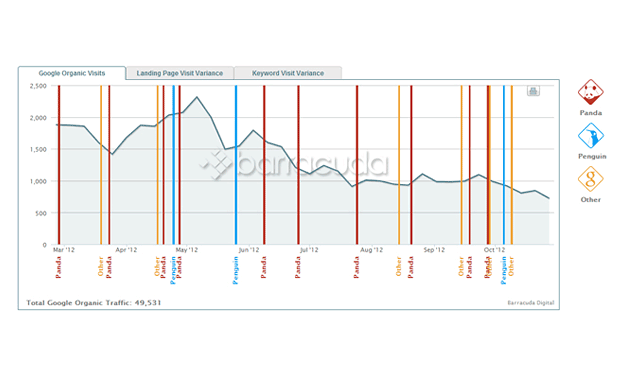 The Panguin tool benchmarks the dates of major Google algorithm changes against your organic search traffic. In order to get all of the data out; Open Site Explorer and MajesticSEO you will need to sign up to their services, however, Open Site Explorer offer a free 30 day premium trial and MajesticSEO allow you to export full link data for your website with the upload of a unique .txt file to the root of your website directory. Once you have access to the relevant tools the next step is to export all link data out of each into individual Microsoft Excel spreadsheets, similar to figure 2.0 below. Once you have all your backlink data from the above sources split out into individual sheets the next step is to collate all of this data into one spreadsheet, so we have a complete overview of all the backlinks. We want to keep consistency throughout our list of backlinks and as Google Webmaster Tools only allows you to export linking URLs we will focus purely on collating a list of linking URLs. 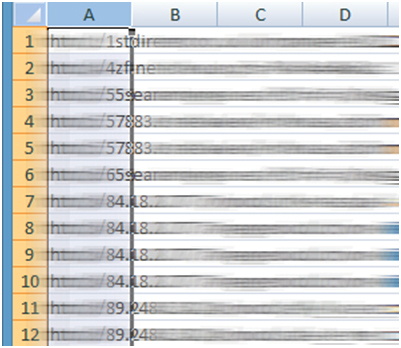 Create a new sheet within your current Excel Spreadsheet and name it “Collated”. We now want to copy and paste over all of our linking URLs from each individual sheet into our newly formed “Collated” sheet. Of course there are going to be duplicate URLs in our collated spreadsheet as high authority links are likely to be flagged in all backlink discovery tools. In order to remove duplicate entries we need to highlight all entries in our collated list sheet. Once we have our linking URLs column highlighted we need to remove the duplicate entries by navigating to “Data” > “Remove Duplicates”. Make sure the correct column is selected, in this case “Column A” and click “OK”. You should now be presented with a message notifying you of how many duplicate entries have been deleted. We now have a complete list of URLs and can begin the process of identifying the ones that are both live and harmful to our website. Although most back link research tools aim to provide the latest data some can be caught short with the data they provide, webmasters may have recently taken down websites or removed pages where our links may be present. In order to get the most up to date data we need to do a real time check of each back link to check whether our link is still live. SEO Tools for Excel is a great Excel plugin that allows you to check live links on the fly with the use of a clever formula. Follow the below video tutorial to installing the plugin. Once the plugin is installed we now need to enter the formula to check our list of URLs for any links pointing back to our website. and press return (replace http://www.YourWebsiteURL.com with your actual URL. Leave the trailing *). SEO Tools for Excel will now go and check the URL in column A1 for any active hyperlink to your website (including your website’s inner pages). Simply drag that formula down to the bottom of your spreadsheet and let the plugin determine the active links pointing to your website. Once completed you should have messages similar to the ones pictured below. We can now see a list of the current active backlinks pointing to our website, we can also see instances of links that return 404 errors, internal 500 server errors or where the website’s webmaster has already removed our link. 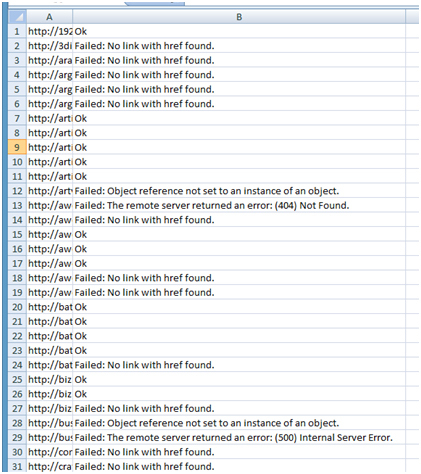 The next step in the process is to delete the rows where the plugin has failed to find a link to our website. The rows left are our list of active backlinks that we can begin to categorise and decide whether they are harmful or not. Once we have our list of active URLs linking through to our website we can run a few more SEO Tools for Excel functions to extract more data including; Facebook Likes, Google Plus Count, Twitter Count, Google Page Rank, Google Index Count. This data will give us a more insightful overview into determining the quality of our backlinks. Where “A2” is the location of the first URL cell. Similarly to when we ran the Check Backlinks formula we want to drag our cell formula to the end of our spreadsheet to run it against all the URLs listed. We can now begin to highlight the low quality backlinks in our backlink profile. Obviously I would still thoroughly recommend visiting all the URLs to gauge a proper understanding of the severity of individual links and I would not make a qualified conclusion as to the effectiveness of a link until I had carried this out. I am sure most will agree that the identification and process of highlighting bad backlinks is a fairly mundane task, however it is imperative to the success of an online marketing campaign and is something that should be dealt with from the get go, rather than leaving to escalate into a much bigger issue later on down the line. Please feel free to let me know your thoughts in the comments below, I would love to hear them!